Today, the combination of cloud connectivity, big data and machine learning has resulted in the rapid development and transformation of speech dialog. It has evolved from command and control-based dialog systems to Natural Language Understanding and cloud technology and is focused on multiple modalities, frameworks and assistants – both cloud and embedded. Speech-enabled human machine interface (HMI) gives customers the control they want while keeping their hands on the wheel. Voice enables both drivers and passengers, giving them access to information, services and applications they use whether in the car or at work or their homes. EB GUIDE Speech Extension lets you design innovative speech-enabled HMI while shortening development time. Leverage its easy-to-use interface to design the next-generation of speech within the car – one that employs the power of hybrid speech architecture, combining embedded with various cloud-based technologies. Model and prototype speech interaction from the earliest phases of development, saving time and addressing challenges early. Leverage cloud to deliver the latest content, information and apps. Take advantage of context- and user-based information derived from multiple sources, within the car and outside it, to make informed decisions while delivering experiences that are tailor made to your users. Model and build your speech-enabled HMI in parallel with your graphical user interface, to ensure consistent and logical interaction between the two. Integrate easily with your current platforms and systems. Customize your Speech offering so it reflects your brand and the experience you want your customers to have. Offer differing levels of language and functionalities across your variants. EB GUIDE Speech Extension supports a variety of speech recognition and speech synthesis systems. Natural Language Understanding (NLU) technology provides easy-to-use speech control. Easily integrate third-party speech frameworks or assistants. Multi-user mode allows simultaneous work by several individuals. Speech dialog simulation enables early testing and debugging. 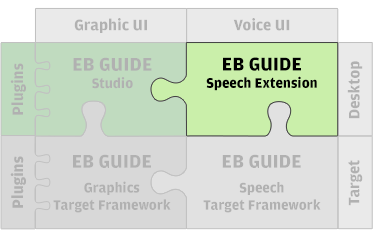 Speech dialog model is created on the PC with EB GUIDE Speech Extension and then interpreted by EB GUIDE Speech Target Framework on PC and target. Learn how EB is helping auto manufacturers integrate Amazon Alexa into the car: Elektrobit (EB) announces it will be among the first Amazon Alexa automotive software integrators. Read how EB and Nuance brought Natural Language Understanding to the road: Elektrobit (EB) and Nuance humanize the new Audi TT.